I am in a magnet middle school on a flexible schedule. I have a very supportive administration and staff and an enthusiastic student body that’s eager to learn. I realize that these circumstances won’t apply to everyone and that I’m very lucky to be in the place that I’m in. Our school allows teachers to write students passes to come to the library for a variety of reasons, including (but not limited to) checking out books, using a computer, working on projects and free time. In general, a student needs to have a pass that either says free time or makerspace to use the makerspace area. Our teachers often use this as an incentive, rewarding students for improved grades or behavior – they’ll often build a little extra time into their class schedule for this purpose. It’s also great for students who finish up their work early and get bored in class. The number of students coming in on passes varies wildly from one day to the next. Often, students will be sent to the library in groups for checkout. When the first couple students finish and are waiting for the others to select their books, they used to get bored and hurry the other students along. Now, they’ll often tinker with a quick LEGO project or doodle on our whiteboard wall. This use doesn’t make for in-depth projects, but it’s a great way for students to get in a little tinkering. As a media specialist, I’ve built up a collaborative relationship with several teachers at my school. Now that we have a Makerspace, I’ve started incorporating it into our lessons when it fits. I schedule classes in our library regularly, so the makerspace has naturally become a part of that. One of my favorite lessons this year combined written conversation strategies and building coral reef models out of LEGOs. I plan on expanding this more. Being in a magnet school, many of my students have to ride the bus for over an hour to get here. This means that our main clubs have to happen during school hours. Last year, we created a club system where clubs met for one hour every Monday, and the grades having clubs rotate. So one week I’ll have 60 sixth graders, the next I’ll have 50 seventh graders, etc. These are generally large groups of students (between 50 and 80) and I have one other teacher that helps me run things. With so many students, there isn’t really enough room or supplies for focused, in-depth design challenges or having everyone work on the same thing. Instead, I set up a variety of stations throughout the library. The computer lab is set up for coding and games, the LEGO wall and K’nex table are made available. In the instructional area, I have such stations as loom weaving, origami, Snap Circuits, Perler beads, etc. Other items like Sphero and littleBits are available as well, but the students have to ask for them. One station that ended up surprising me with its popularity is our interactive whiteboard. I had a coding game open on it once for STEAM club, and a student chose to open up Paint instead. 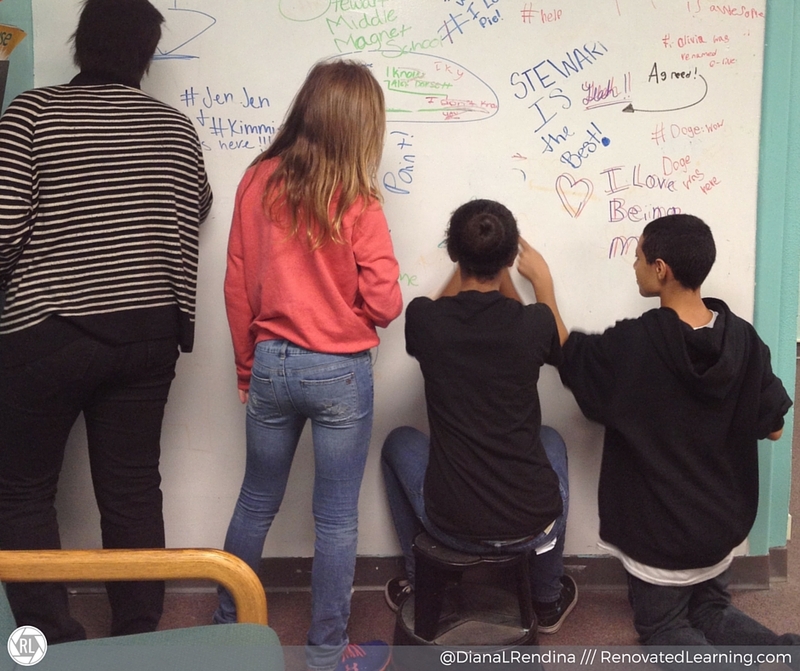 Rather than scold them for it, I was excited to see just how much the students loved getting to draw on the board. It’s always a big hit and students will often save jpegs of their works on the computer. We don’t have a huge amount of participation in after school clubs at my school, but I had a small but mighty group of about 10-15 students in my afterschool STEAM club this year. 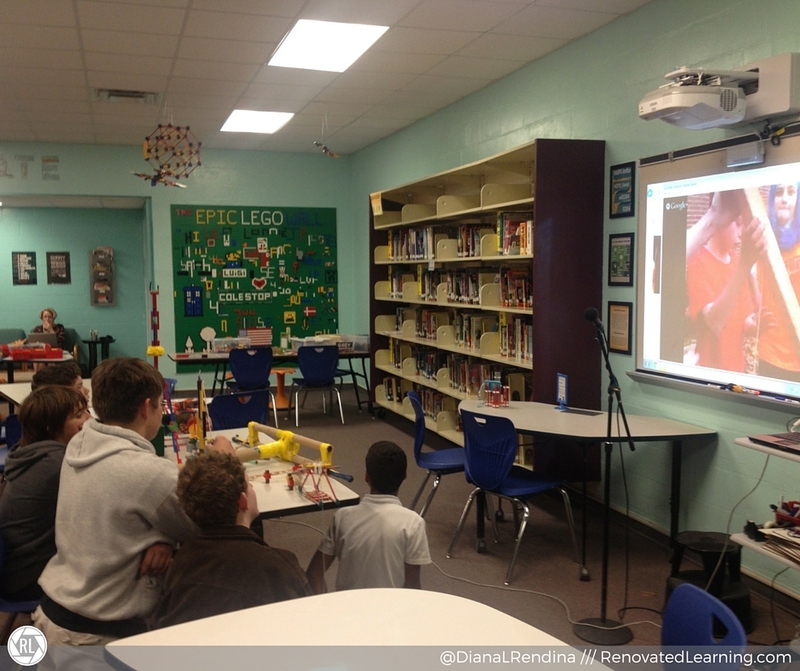 We met twice a week for an hour and a half (this year will be just once a week) and the students had free time to work on their own projects, as well as collaborative design challenges. Some of our challenges included our Cardboard challenge, Catapult challenge and MaKeyMaKey challenge (last two done in collaboration with Colleen Graves and her students). This coming school year, I plan to have more design challenges with this group. I’m also inviting members of our local Maker community to come in for different lessons and workshops for my students, like Arduino and Brushbots. I’m also hoping to emphasize our Mini MakerFair more this year and maybe have more than one. 4-23-16 Edited to Add: Our afterschool Stewart Makers Club has grown a LOT since I originally wrote this post. Check out this more recent post to see how the program has changed. 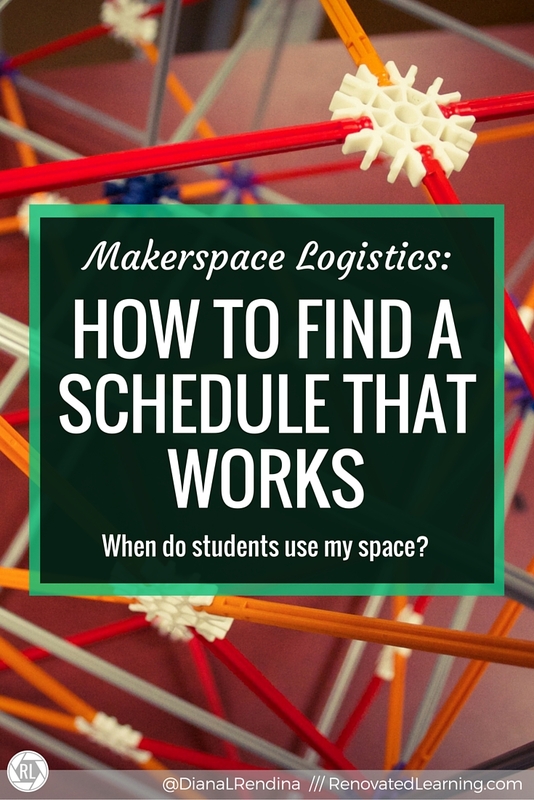 What are your scheduling logistics? 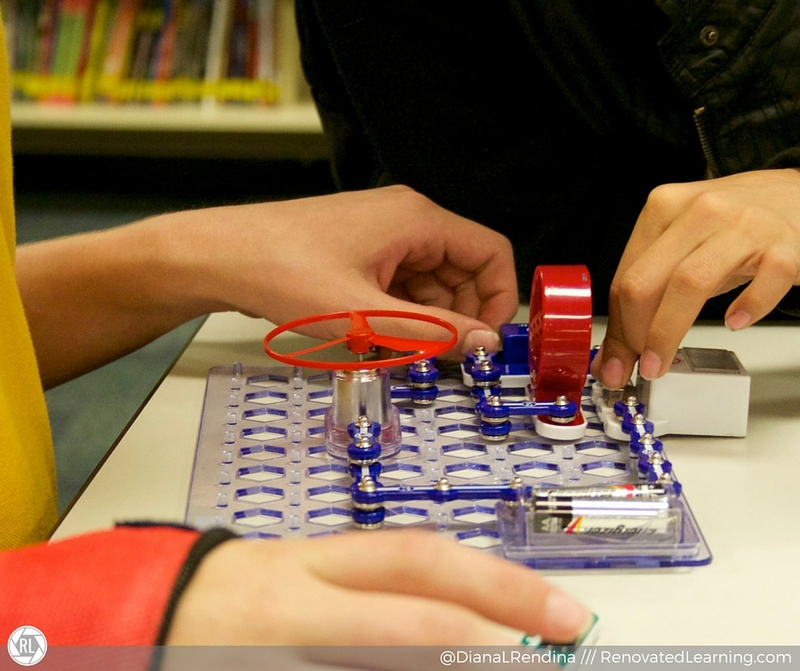 When do students utilize your school Makerspace? Anybody out there have any scheduling ideas for an elementary school? We are fortunate to have music, art, world languages, dance, and physical education in our schedule. The teachers feel that they don’t want another thing “scheduled” during their day. I am wondering how to get the teachers excited about using the space to connect to the curriculum. Would love any suggestions. It’s so easy for us to say, “Yes, but my schedule wouldn’t allow me to do this…” I really appreciate your point of view on this post and thank you for sharing your unique scheduling situation. I’m on a fixed schedule of my own choosing for the first year of our space. I hope it evolves to be a more free flow structure, but I’m excited and happy about the possibilities. Your post is a breath of fresh air and possibilities! I was wondering if you run the library as well? 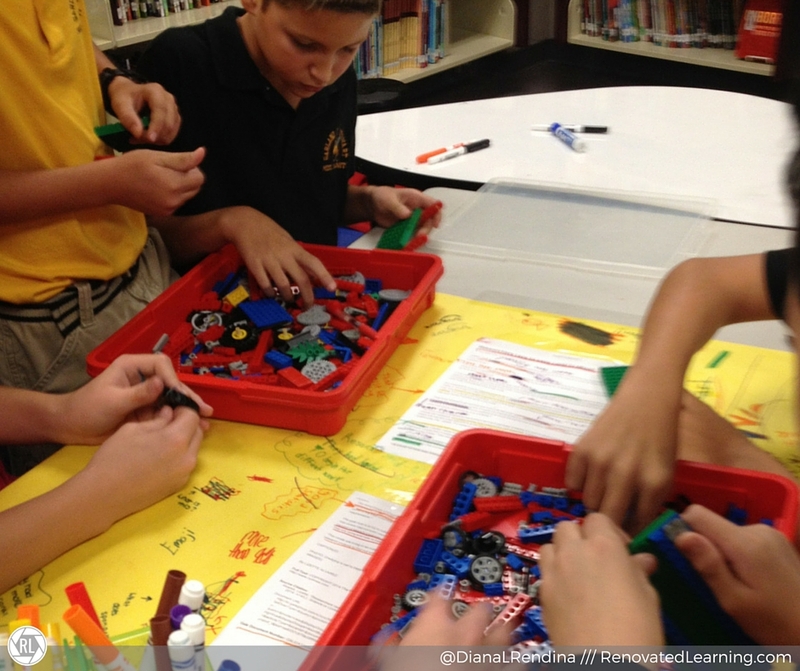 My role this year is to support a Maker Space and run the library (on a part time basis). We are a K-3 school and are trying to shift away from ‘fixed’ library times and move towards a more flexible Learning Commons. We would like the visits to the library to become more purposeful. Any suggestions? Much appreciated.